Our conservatories at Fairweather Windows are all bespoke and made to measure for each individual client. They are available in a wide range of colours and styles to suit the customers’ specific design and size requirements. 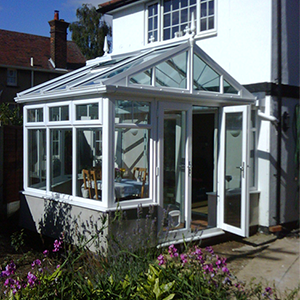 Our team are experienced at helping customers select the right conservatory for their needs. Our conservatory roofs have a full aluminium Quantal structure and are available in any colour shade to match the conservatory window and door frames. Self-cleaning and tinted glass types are available to help control heat and sun-light. The glass in these roofs can be tinted blue, grey or bronze for anti-glare. Integral blinds are available to go in the door and window sealed glass units. These blinds are in between the 2 panes of the glass unit, eliminating the need for awkward cleaning, whilst ensuring shade and privacy when required. To find out more, please contact us on 01279 813888 and have a chat with our team.